So, I’ve postd a video every day this week, and I figured I should treat you all to something really special today. Jack Playing – photos from this week, of Jack and his mom playing (they were “camping” in Jack’s room in a home-made fort, and then Jack was “taking photos” with his camera, and then playing with cars). Furniture by Stan – Cyndi’s uncle refinished some antique furniture that my mom gave us a while ago. The furniture looks awesome now, and all the drawers work perfectly now mom! Now our guests (and the new baby) will have a place to put their clothes when they come visit. Aggie Jack – the photos from our weekend Aggieland trip. Jack by Erin – Erin took some photos of Jack with her mom, sister, Chrstine and I after church on 8/27. Too fun! In the Sandbox – just some photos of Jack in the sandbox one afternoon. Ben and Jack at Serranos – After church one day, we met Murphy and Amanda at Serranos by accident. We ate inside while Murphy and Amanda (and their guests) watched Jack and Ben, then we came outside and watched the boys while they ate. The boys had sooo much fun playing together. Levy Party – Lori and Herbert threw a party for the kids one weekend afternoon. Lots of water splashing and playing outside. Lakehouse Swimming – We went to visit Debbie and Raymond on August 19th, and I took these photos outside around the pool. Jack just loved swimming this summer! 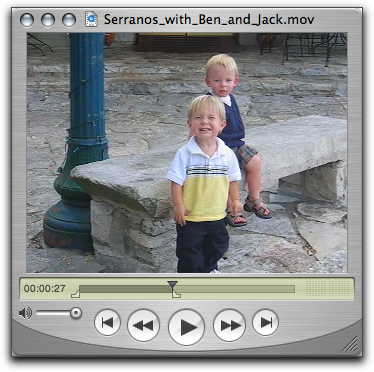 The video of Jack and Ben is too cute! It’s like watching twins playing together. Can you imagaine?! ?